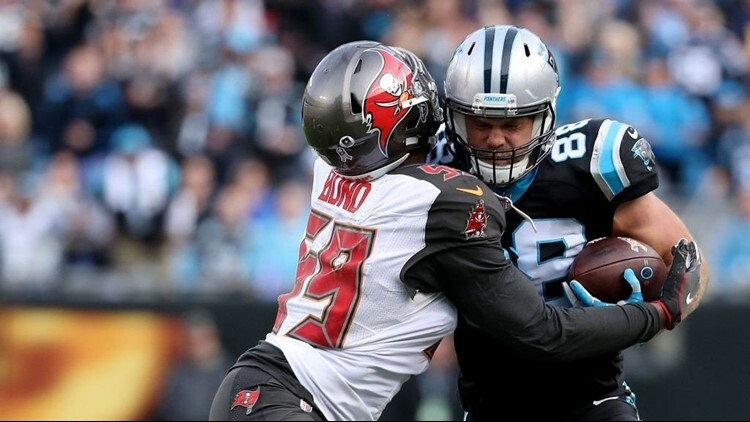 Greg Olsen #88 of the Carolina Panthers runs the ball against Devante Bond #59 of the Tampa Bay Buccaneers in the fourth quarter during their game at Bank of America Stadium on November 4, 2018 in Charlotte, North Carolina. Ryan Fitzpatrick, who started in place of the turnover-prone Jameis Winston for Tampa Bay (3-5), finished with 243 yards passing and four touchdowns. CHARLOTTE, N.C. -- Cam Newton completed 19 of 25 passes for 247 yards and two touchdowns, Christian McCaffrey racked up 157 yards from scrimmage and scored twice and the Carolina Panthers built an early lead and held on to beat the Tampa Bay Buccaneers 42-28 for their 10th straight home win Sunday. Bucs Dirk Koetter: We put our defense in two holes, the interception and fake punt. We are in this pattern we go out and get behind - get killed in the second quarter, rallied like hell in the 3rd and fade off in the end. But the return of "Fitzmagic" wasn't enough as Newton made it a two-possession game when he found Samuel, who made a leaping grab in the end zone with 9:10 left in the game. It was the second-year wide receiver's second TD of the game. He also scored on a 33-yard reverse. Bucs Dirk Koetter: Ryan (Fitzpatrick) will be our starter next week. Fitzpatrick, who started in place of the turnover-prone Jameis Winston for Tampa Bay (3-5), finished with 243 yards passing and four touchdowns - two each to Adam Humphries and O.J. Howard. But Fitzpatrick also had a key interception on the game's second possession leading to Carolina's first touchdown of the game, a 1-yard run by fullback Alex Armah. He was also picked off late in the fourth quarter by rookie cornerback Donte Jackson, sealing the win.